Quest, and sailed south with the famous explorer, who unhappily died in South Georgia almost before the expedition had begun. However, work did go on and Wilkins carried out useful research into the lives of many varieties of birds, seals and penguins. After that interlude, he was again sent on a cinema commission, this time by the Society of Friends, to make a film of the appalling famine conditions in Russia, and to illustrate the work of mercy being done by the Society. Readily he put his heart into this job because he felt so sympathetic to the human misery and starvation he saw on every hand in the frozen grainlands of central Russia, and his three-reel 'New Worlds for Old' still bears striking testimony to this. He had really intended to use one aeroplane and one pilot, but by the time the Detroit magnates, who were backing him, had had their say he had to have two aero planes and two crews. The aeroplanes were both Fokkers, a single engined one with a 400 h.p. watercooled Liberty, christened The Alaskan, and a tri-motor with 220 h.p. Wright Whirlwind radials called The Detroiter. Aircrews were obtained on loan from the army, notably Major Lanphier and Lieutenant Carl Ben Eielson, the latter having had most flying experience. Next year, Wilkins came back to Fairbanks in February with two new aeroplanes, skicquipped Stinson biplanes, fitted with 22A h.p. Wright Whirlwinds. The Whirlwind had been used by Lindbergh on his famous Atlantic flight, and marked a new era of reliability in aero engines. He intended to use these for landings out on the ice of the Polar Ocean in conjunction with The Detroiter as supply machine. Wilkins and Eielson returned for the third time in 1928 with the newest and most efficient aeroplane-a Lockheed Vega also fitted wirh the 220 h.p. Wright Whirlwind. Taking oft with an overload of petrol on skis, they planned to fly over the Canadian Arctic Islands and then around North Greenland to Spitzbergen, thus cornpleting a circle of more than 2,000 miles over the Polar Basin. Navigation would depend mainly on sun shots with an R.A.F. Mk. V bubble sextant since the magnetic compass would suffer an average rate of variation change of jo per minute on a flight of about twenty hours, apart from having a very sluggish performance in these regions. After April 5th the sun would be above the horizon all the way to Spiubergen, and that would be ideal for solar navigation. Despite the appearance of heavy storms ahead in the Spitzbergen direction, Wilkins and Eielson were in complete agreement that they should press on rather than risk an immediate landing on the ice to await a change. The outside air was -45oC and they knew there must be violent mixing with the warmer air-stream around the land-mass of Spitzbergen. So some hours later after climb¬ing to 8,000 ft for a sun-shot, they had to let down into a boiling cauldron of cumulus cloud in extremely turbulent air. The compass wavered all over the place and, as they neared the sea, loose objects were thrown around the cockpit by what turned out to be a raging blizzard. 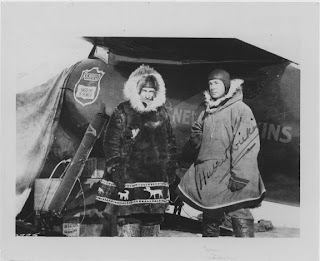 For four days Wilkins and Eielson were imprisoned by the weather and then, when it cleared, the aeroplane's skis kept freezing solid onto the snow and would not budgeuntil Wilkins pushed it. Twice he failed to scramble on board and Eielson took off without him. On the first occasion Wilkins grabbed a rope dangling from the cockpit with his mouth and loosened all his teeth before finally dropping off, to be hit a glancing blow by the tail-plane as he fell into the snow. In the end, only by using a piece of drift-wood as a sort of punt-pole did he finally manage to start the machine and scramble on board successfully. From the foregoing alone, Wilkins stands out as the father of Arctic Aviation, but that was by no means the end of his polar activities. In the same year that he had flown from Barrow to Spitzbergen, he sailed south with the same aeroplane and the same trusted Ben Eielson as pilot, to make the first flight ever in Antarctica. He beat Byrd for this honour by only a couple of months, but unlike Byrd he was not intent on flying to the pole. To Wilkins it seemed much more necessary, though less glamorous, to explore first the fringes and flanks of Antarctica before worrying about the pole. For this purposehe set up a base on Deception Island, off the coasi of Graham Land (or Palmer Land as the Americans preferto call it), and took a second Lockheed aeroplane with him. Not sure whether the best surface for would be land, water or ice, he equipped his machines for wheel, float or ski undercarriages. Expense was much less important now because his Arctic success had resulted in the Hearst press becoming a major backer of his new venture, which was called 'The Wilkins-Hearst Expedition'. Unhappily, there was not much snow on theland and the sea ice was not firm, so wheel undercarriages had to be fitted. Otherwise skis would have been better as offering greater choice of possible landing places away from base, on glaciers or other ice. The only surface at all suitable for 1akeoft consisted of volcanic tuff-a coke-like sub¬stance prone to cut rubber tyres, and the 'runway' on the side of a hill was barely 800 yds long, only 40 ft wide and had two 20" bends in it. This would limit flying to half-loads and therefore restrict range, but no better place could be found. In effect this meant that the prospect of making a2,AO0 mile flight westwards to the Ross Sea was out of the question. This was disappointing because Wilkins would have liked to have done such a flight for the sake of his policy of exploring the rim of Antarctica rather than the centre, with the eventual objective of establishing a chain of meteorological stations around the periphery. The first local flight was made on November 16th, 1928, and four days later Wilkins set off with Eielson on their first fligbt of exploration. Conditions for seaplane flying now deteriorated at Port Lockroy, and the William Scoresby therefore took the aeroplanes south in search of a suitable flying area. Some open water was found and a couple more flights were made, but due to worsening weather over the plateau, Wilkins could only fly to the west of it. He did however succeed in making a flight right around Charcot Land, thereby proving it an island and dispelling any previous doubts that somewhere it was joined on to Antarctica. December had ended and with it the Graham Land weather seemed to have closed for the season, so Wilkins had the William Scoresby take him 600 miles to the west, where he finally made a 230 mile flight southwards over the pack and icebergs from the vicinity of Peter I Island. As a season's work, the 1929 flying programme had been disappointing in that it had never given Wilkins the opportunity to recheck the existence of the four channels he had reported in 1928. Actually the subsequent survey work of John Rymill's expedition in 1934 proved con' clusively that Graham Land was a peninsula, and that the glaciated tongues Wilkins had seen as he flew down the east coast did not in fact traverse the land to the west. He had been misled by their appearance from the air, thereby proving how difficult it is to make reliable air observations on the basis of a single flight, without the backing of ground survey teams. In fact it is generally impossible when flying over Antarctica to tell whether you are over sea covered with ice or land covered with ice, and here the advantage must always lie with the man on the ground, who can take soundings to prove whether the rock beneath him is above sea-level or below. 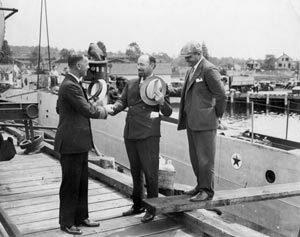 In Bridgeport, Connecticut, Wilkins found that the United States Navy had a number of submarines built in 1918 which were due for scrapping and he managed to lease one for five years at the rate of one dollar per year. He named her Nautilus and after a long and expensive refit, she sailed late for Europe on June 10th, 1931. She was not in good shape and one of the main engines broke down, it was said, due to mishandling by the crew, 850 miles from lreland. Luckily the United States cruiser Wyoming was near at hand and towed the submarine to Devonport, for repairs in the Royal Navy Dockyard. These lasted so long that Nautilus was not able to set out from Spitzbergen until August 18th. Now it was so late that the original plan of crossing under the polar ice pack to Alaska had to be postponed until the following year, and a programme of merely testing the equipment on board by means of a trial dive under the ice was sub¬stituted. Even this was prejudiced by the sabotage of a crew member who removed the diving rudders whilst the vessel was in King's Bay because he did not want to go under the ice. It was not discovered until the expedition had reached the ice-edge, where a storm from the east caused the Nautilus to heave to for several days, and August was far spent before a dive under the ice could be attempted, trimming the vessel by ballast alone. Wilkins was determined to carry on with the dive, even though most of the crew would gladly have gone home. As soon as the Nautilus, moving at little more than two knots, went under the ice, the crew heard the most awesome graunching* and rending noises, as though the ice were cutting through the steel plates of the hull like a tin-opener, forcing the captain to return immediately to open water. However, an inspection revealed hardly any¬thing beyond a few dents and scratches, for all the noises had been exaggerated due to the drumlike form of the structure. Accordingly the dive was resumed but the noise most of the time was horrifying and everyone was heartily glad when they surfaced again barely an hour later. After that the submarine only dived a few more times under ice-floes before being compelled to make for harbour due to worsening weather, on September 8th. After the 1931 submarine experiment, Wilkins's next project was as expedition manager to his old friend Lin¬coln Ellsworth, for the latter's gallant attempts to make the first trans-Antarctic flight, as already described in Chapter 6. 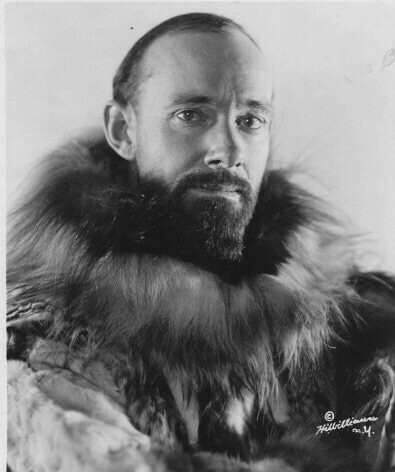 Ellsworth realized that a man with such wide experience of polar travel, and aviation in particular, would be invaluable to him in a project of this sort. At the outset Wilkins was entrusted with the selection of a ship for the expedition, and chose the old Norwegian herring trawler Fanefiord renamed Wyatt Earp in honour of Ellsworth's great frontier-marshal hero. One of Wilkins's most useful activities on the expedition was in calming Ellsworth and restoring normal relationships between him and his pilots whenever, in their judgment, it became necessary to turn back, first with Balchen in January 1935 and then with Hollick Kenyon in Novem¬ber of the same year. On the latter occasion, Ellsworth was so exasperated he would certainly have substituted Lymburner for Kenyon, disregarding the fact that Lymburner was the less experienced man, had not Wilkins tactfully calmed him. Thus when Wilkins steamed into Little America in the Wyatt Earp and found Ellsworth safe with Kenyon, he could fairly feel he had played a useful part in the expedition's successful conclusion. Although by 1937 Wilkins had reached the age of forty-nine he was still extremely fit, and when he suddenly heard that the Russian flyer Levanevsky was missing on an attempt to fly from Moscow to Fairbanks by way of the pole, he immediately offered to lead a search on behalf of the Russian Embassy in Washington. This was accepted with such alacrity, and Wilkins organized things so fast, that he had bought a Catalina flying-boat for the search within four days of the disaster, believed to have happened near the pole on August 13th. This certainly was an opportunity that appealed enormously to Wilkins. Once more he would be able to fly in the Far North, and extend the range of the activities he had begun from Point Barrow eleven years before, with flights almost up to the pole itself. Moreover Wilkins's sense of humanity, and his inborn sympathy with his fellow human beings-brought out particularly with Eskimoes and Aborigines,* made him genuinely anxious to try and save the Russian airmen if it were still possible. Fog and ice formation in the air hampered the arrival of the party at Coppermine and they had io make a forced landing in a lake just as it was getting dark. However they reached their rescue base next morning and made the first search flight over the Arctic Sea, to the north of Banks Island and across the McClure Strait, on August 22nd. On this occasion, they carried extra drums of gaso¬line in order to be able to refuel if a safe landing-place could be found, and Wilkins almost got gassed by the fumes due to leaks. He had to soak up the spilt fuel with a rag and evaporate it through a ventilator. Heavy cloud, over which Kenyon flew for some time in the hope that it would break, frustrated the search and made him turn back. The radio operator was sending messages intended for Levanevsky every half hour, and maintaining a con¬stant watch but, by the time the flight ended back at Coppermine afier thirteen hours, not a thing had been heard. And so the search went on whenever the weather looked the last bit favourable. On one nineteen-hour flight with the Electra, Wilkins flew a zig-ng course in good visibility to within 150 miles of the pole without seeing any trace of men or aircraft, and although he was still game to go on trying, a cable suddenly came in from the Russian Ambassador in Washing¬ton announcing the end of the search. That was on March 19th seven months after Levanevsky had disappeared. Against all criticisms, Wilkins's record as a ground explorer under Stefansson, when his loyalty alone saved his leader in the Arctic, and as leader of his own highly successful expedition to North Australia, put him in the front rank of explorers generally. But his pioneering achievement in polar aviation-the three seasons in Alaska culminating in his superb flight across the Polar Basin to Spitzbergen, plus his pioneering flights in Antarctica, put Wilkins in the forefront of polar flyers in particular. When one thinks that over and above these unique qualifications, Wilkins also led that very daring expedition in aid of Levanevsky, one can see that for a lifetime of adventure and exploration few others have approached in colour and variety the achievements of this Australian farmer's boy. The Americans were not slow to acknowledge the pass¬ing of such an exceptionally colourful person, and one who had worked unceasingly for the United States during the last sixteen years of his life. The American Government therefore decided to render the last rites to Wilkins in a unique manner, and one that complied with his expressed desire that his ashes should be scattered over the Arctic snows.